Marking another milestone in the company’s North African expansion strategy, Mövenpick Hotel du Lac Tunis has opened its doors, featuring 189 contemporary rooms and suites and a raft of exceptional dining, spa and meetings facilities. Conveniently located in the city’s thriving Berges du Lac business and diplomatic district, just ten minutes from Tunis-Carthage airport and downtown Tunis, 15 minutes from the trendy towns of Carthage, La Marsa and Sidi Bou Said, and within easy reach of the city’s cultural sites, shopping malls and golf courses, the new property has broad appeal, according to Marc Descrozaille, president – Middle East & Africa, Mövenpick Hotels & Resorts. “With an enviable lakeside location, outstanding facilities and major attractions on its doorstep, I am confident Mövenpick Hotel du Lac Tunis will quickly establish a reputation as one of the city’s most sought-after properties, popular with business, leisure and wedding guests,” he said. The property’s rooms and suites, some with balconies, feature modern elegant furnishings and décor, the latest in-room technology, and breath-taking city or lake views. 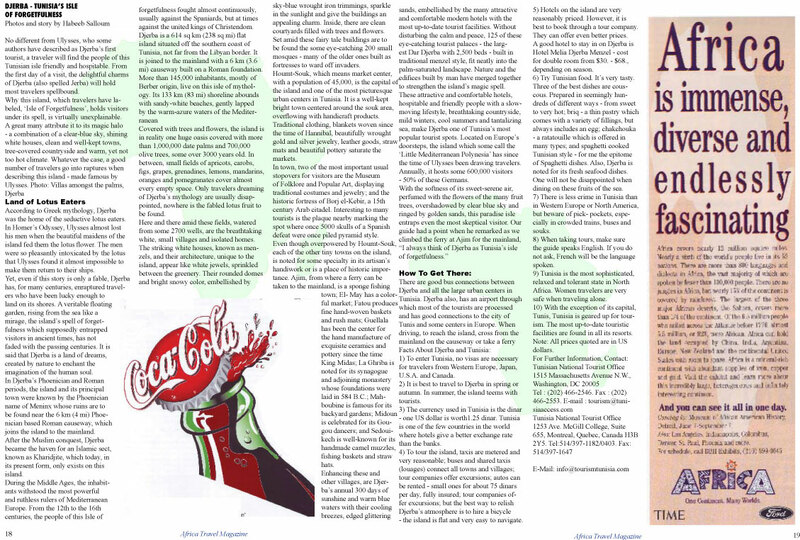 23rd in Africa with five additional hotels set to open in the region by 2020. TUNIS, Nov. 16 (Xinhua) -- A total of 6.11 million tourists have visited Tunisia by Nov. 10 in 2017, up 24 percent from last year, Tunisian Minister of Tourism Salma Elloumi said Thursday. "We hope for more tourist traffic in the last month of this year, as tourism revenues have reached 929 million euros (1.1 billion U.S. dollars)," Elloumi said in a parliamentary session. The number of overnight stays has reached 11 million, against 9 million during the same period of 2016, she added. According to the minister, the number of tourists who visited Tunisia from July 1 to Nov. 10 exceeded the record number in 2014, particularly thanks to the growth of 19.3 percent in European markets. The Russian market in particular has influenced the performance of the Tunisian tourism sector with 513,000 tourist arrivals as of Nov. 10. Similarly, the German, British and Scandinavian markets have grown 43.5 percent, 18.4 percent and 28 percent respectively. Among Maghreb countries, Algeria is the largest market for Tunisia with a growth of 33 percent, followed by Libya with a growth of 17 percent. Elloumi also pointed to a significant increase in the flow of Chinese tourists, saying 16,000 Chinese tourists have travelled to Tunisia as of Nov. 10, an increase of 190 percent. TUNIS - The Viking Cruises ship Viking Sea left the La Goulette port on Thursday, after arriving Wednesday with about 900 mostly American passengers aboard in the first cruise-ship docking at Tunis in 2017. In honor of the passengers, the Tunisian Culture Ministry and Goulette Shipping Cruise (GSC) - the company under state protection that manages cruises at the Tunis port - organised a classical music concert at the port's tourist village. "This is an excellent opportunity to promote the image of Tunisia as a nautical destination," said GSC marketing and communications director Maha Ben Slimene. The first cruise ship to return to Tunisia after the interruption due to the terrorist attack in 2015 was the luxury cruise ship MS Europa of the German company Hapag-Lloyd Cruises, which arrived on October 6, 2016. 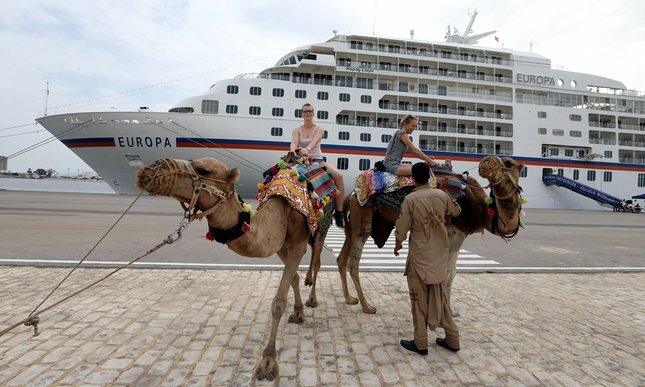 German tourists ride camels after disembarking in Tunis from the cruise ship MS Europa. Photograph: Mohamed Messara/EPA. The first cruise ship to visit Tunisia since 59 tourists were killed in two terrorist attacks last year docked this week in La Goulette, the port of the capital, Tunis. The arrival of MS Europa has boosted hopes for a revival of the country’s tourism industry, which nosedived following the deadly beach attack in the resort of Sousse in June 2015 in which 38 holidaymakers died, and another attack in March 2015 when 21 tourists were killed by gunmen at the city’s Bardo museum, one of the country’s main draws for foreign visitors. The ship, carrying more than 300 passengers, mostly Germans, was greeted on Thursday by musicians, dancers, camels and Tunisia’s minister for tourism, Selma Elloumi Rekik. Local traders presented disembarking holidaymakers with garlands of jasmine. Security was tight for the visit, with armed police and soldiers visible around the city’s medina, a Unesco-listed world heritage site, and other tourist attractions. Tunis was a regular stop on the Mediterranean cruise schedule until the 2011 revolution, which sparked the wave of uprisings across the Middle East known as the Arab spring. Last year’s attacks, which Islamic State said it carried out, were a further blow for the struggling sector. 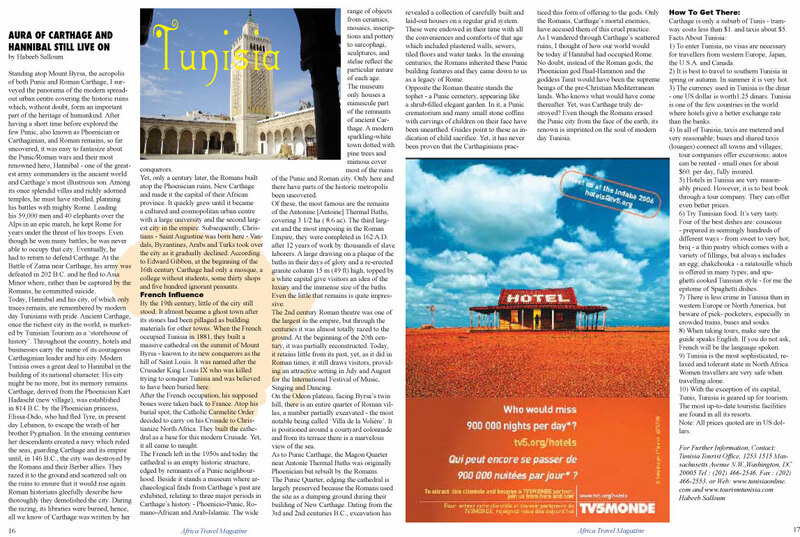 Before 2011, the tourism industry contributed 7% of Tunisia’s GDP and directly employed 400,000 people. Dozens of beach resorts have closed since the Sousse attack after European countries warned citizens to stay away. Tour operators and charter airlines struck the north African country off their destination lists. Some politicians have argued that Tunisia needs to develop a new tourism strategy, targeting wealthy visitors rather than offering cheap, resort-based holidays. A cruise operator registered in Switzerland is planning a stopover in Tunis in January, according to the tourism ministry. The Medina of Hammamet is one of the most beautiful in the world, completely surrounded by a wall that defends the Mediterranean, would be floating in the sea like a ship. Located on the wall and looking out over the Gulf of endless white beaches, Dar El Bahr is the first major window of this imaginary ship, in which pride Sidi Bou Hdid dome, next to the house, resting on the bow. Adapted to the mild forms of Arab coast constructs the house maintains an air of absolute white light covering walls, domes and traditional style floors. The internal floors are marble and fully crossed arches of some of its rooms are supported on columns and granite stone recovered in a sensual fusion of Arabic and Roman Mare Nostrum fishing life by the sea. 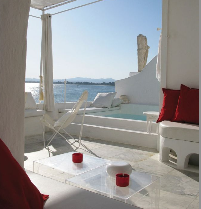 Taking inspiration from the fabulous summers 70s in Hammamet enjoyed the first European travelers, decoration allows the coexistence of plastic Panton functionality with modest whitewashed wood furniture musharabía of local crafts. A courtyard style vertebra Arab houses that make up the two floors housing. On the street level floor is the master suite and a guest room. On the first floor are the kitchen, another guest room, dining room, living room and another in the summer sitting room is completely open to the outside neighbor to the terrace overlooking the sea and where there is a small pool. Crown the house flanked by two terraces fort and lighthouse where the view over the bay and the dome of Sidi Bou Hdid is spectacular. Entering through the door framed by a beautiful ancient marble relief, found himself the central courtyard of Arab houses that distributes stays, a resting bench at the entrance and one in the center invite rest and nap. On this floor are the magnificent suite and a guest room. A stone fountain gives soul to the space with the soft sound of water, a huge sculpture representing a tasbih welcomes us at the bottom of the stairs leading to the first floor. Two levels make this space: the sleeping area is composed two twin beds, lavishly wrapped by many cushions, has satellite TV, the area is home to a hot bath for up to 4 people with jacuzzi, a massage bed, a shower two sinks and a toilet. TV with satellite connection. The spacious suite has a small room-in closet with shelves, a seat, mirror and wardrobe with safe and a bureau with another seat and computer and internet WI-FI. The location of Dar El Bahr is privileged and the panoramic view offered: the bay, the dome, the fort and the lighthouse. There is a rest area where covered, cushioned feel alone in the immensity of the sky and sea. On moonless nights the view of the stars is impressive. There is also a bar that serves bar area for unforgettable evenings. At another level becomes the terrace solarium, two chairs recovered from the sixties invite tan and joy.